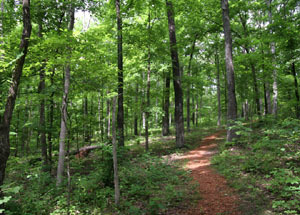 The United States Congress designated the Crab Orchard Wilderness (map) in 1976 and it now has a total of 4,050 acres. All of this wilderness is located in Illinois and is managed by the Fish and Wildlife Service. The Crab Orchard Wilderness is bordered by the Panther Den Wilderness to the south. Smack dab in the middle of the Mississippi Flyway, Crab Orchard Wilderness provides a winter feeding and resting area for an average of 40,000 Canada geese each year. Agriculture and logging in the early 1900s so depleted this region of forest, wetland, and grassland that wildlife could barely subsist here. The refuge and subsequently Wilderness was formed to restore an adequate ground for geese, ducks, wild turkeys, a multitude of white-tailed deer, and small mammals including coyotes, beavers, opossums, and raccoons. Most people visit the Wilderness to bird-watch, hunt, and fish. Anglers cast a line for bass, bluegill, and crappie on Devil's Kitchen Lake and Little Grassy Lake. The Wilderness forms the southern tip of the refuge and encompasses sections of Little Grassy Lake and Devil's Kitchen Lake. Several parking lots and boat launches provide easy access to the water just outside the Wilderness. Within Crab Orchard Wilderness boundaries lie dramatic sandstone outcroppings, wood-lined creeks, and potential seclusion, but there are no maintained trails. Camping is restricted to designated campsites, of which there are none in the Wilderness area (except for preexisting camps for Boy Scouts and Girl Scouts). Planning to Visit the Crab Orchard Wilderness? How to follow the seven standard Leave No Trace principles differs in different parts of the country (desert vs. Rocky Mountains). Click on any of the principles listed below to learn more about how they apply in the Crab Orchard Wilderness.